The Lindy's Stainless Steel Covered Cake Pan is made from durable, high quality 18/10 stainless steel, so it won't rust like other cake pans might, and you don't have the added worry of cooking with aluminum cookware. 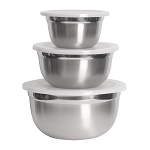 Strong, practical durable, with a snap on lid to keep your goodies fresh without aluminum foil or plastic wrap. Great for potlucks, or just keeping cake fresher longer on the countertop. The bottom is slightly raised in the middle, so that when your cake is popped out and inverted, the sides of your cake will be slightly lower on the edges. This will also accommodate cakes that tend to shrink slightly in the middle while baking, in which case, you will have a cake top that is straighter than would have been if you baked the cake in a straight pan. Dimensions = 10" x 13" x 3-1/4"
I LOVE this pan. I now have 2. the lids seem to be specific to each pan. if I get the wrong one on the wrong pan, it won't latch. A little hard to get the lid off but I know it won't come off accidently. Heavy metal. after my first pan I ordered 2 round cake pans. I'm looking to get some cookie sheets next. I LOVE this pan! It’s a really nice heavy guage stainless steel. It has never warped in my oven. I was pleasantly surprised how deep the pan was when I got it. This gives you a lot of options to decorate cakes without messing up the icing when you put the lid on. My chocolate cake stayed moist and protected until it was gone. I’ve even roasted a whole chicken in this pan and it cleaned up beautifully! This pan is a must have!